When neighbors noticed black trucks, satellite dishes, swirling radars, and "a portable launch pad, with something covered up" on a Waller County Ranch, they had no idea what to think. CNN's Houston affiliate KPRC has partially solved the mystery: Houston police plan to start using unmanned drone aircraft. But, a question still remains: what, exactly, will the drones be used for? The mood surrounding Waller County Ranch was highly secretive. At the entrance to the test site stood a Houston police road block, making sure only those invited were let through. HPD lieutenants refused to answer any questions from KPRC reporters, but KPRC still managed to gain footage of the "test [we] were not supposed to see." "[The] drone was able to use a high-powered camera to track us," says Stephen Dean, who tracked the drone for KPRC. "Those cameras can actually look into people's homes or even follow them in moving cars." 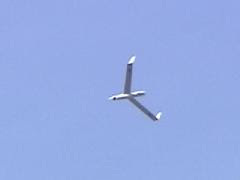 Drone Planes are not new to the United States. The military has been using drones for secret war zone surveillance for years; drones were also used to put out the California wildfires last month. The drones used for the test in Houston weigh only 40 pounds, but can carry 15 pounds more in gear. They are able to stay airborn 15 to 24 hours without landing. According to Dean, the fact that Houston police will be able to employ such high tech security devices raises "all sorts of new questions." One question: how will law enforcers will utilize the drones? A policeman conducting a search needs probable cause or a warrant -- will drone planes adhere to the same laws? When the HPD realized their "secret test" was being filmed, they "hustled together" a news conference. "I wasn't ready to publicize this," said Martha Montalvo, the executive assistant police chief. She said that potential public safety applications include "mobility, evacuations, homeland security, search and rescue, as well as tactical." Montalvo said that it was "too early to tell" what else HPD will do with the aircraft. Police helicopter pilots said the entire air space surrounding the test site was restricted and, according to Dean, "threatened ... two investigative pilots with action from the FAA if [they] didn't leave." But, when KPRC checked with the FAA, they learned there never was a flight restriction. For Dean, that leaves some wonder "whether the police are now ready to use terrorism fears since 911 to push the envelope further into our private lives." "We've seen that some of these technologies that are being used in the aftermath of 9/11 that we thought were necessary to protect our security in that time are now being used to diminish privacy in other contexts," said an unidentified male filmed by KPRC. "And that is extremely worrisome." Read moreabout how this is a federal program tested in Houston by clicking Here. This is why we need Ron Paul!